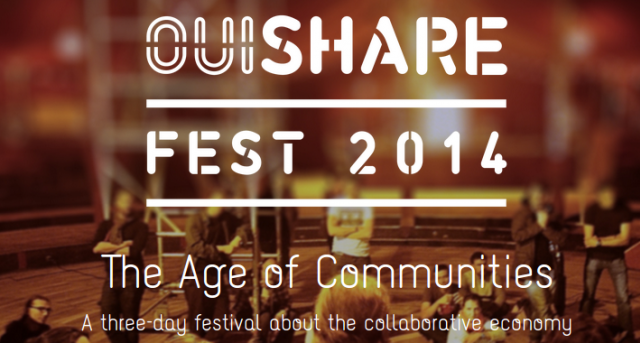 I attended the 2014 Ouisharefest last May, a 3 days event about collaborative economy. Peter Hesseldahl was one of the presenter, and he shared his views in a previous post his views about massive platforms for cocreation. Below are a few additional notes I’ve grabbed from the various speakers during this event rich in food for thought. Design focus is changing: from finished products to processes, creating platforms for cocreation, and from provider to enabler. “For you, to you” is being replaced by “With you, by you”. for experts: enabling learning, health, innovation. It’s not just about money, it’s about access and sharing: unused value is waste. It’s not about ownership: there must be more to life than having everything! It does not always have a business model: sometimes we do it only for pleasure. In-direct relation from effort to benefits is changing: my success depends on the success of the others, I don’t see the success coming back to me directly, ‘me’ and ‘we’ intersect. Empathy is the driver building the link between people on collaborative platforms. This ‘new normal’ requires new tools: trust (trust is central: in trust we trust!) and reputation mechanism, legal contracts for open IPR, organizational models, regulation, taxation, currencies, and vocabulary. We are moving from institutional to distributed power. Large businesses operate to derisk from what’s going to happen, and potential disruption of their value chain. Brands look for ways to avoid becoming obsolete, alike ‘tomorrow’s narrowband’, and building sustainable innovation, is another stake of akin cocreation platforms. Innovation is the brand’s lung, and cocreation seems the cornerstone to nurture the relationship between brand and community.